Old World Cream Scone Mixes only need one item to add for a wonderfully tender, light Scone. Simple, easy, fragrant and a treat for the eye. Let others envy your baking skill of a wonderful scone. Just add heavy whipping cream, blend it in to the mix. Make a variety of flavors from sweet to savory. Serve a variety of ways – all the way from just hot, slathered with butter to sweetened fresh fruit with cream or ice cream. 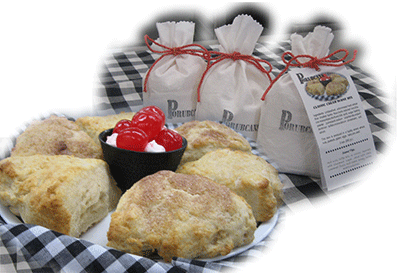 Porubcans Cream Scone Mixes come in 3 flavor selections: Classic, Oatmeal, and Chocolate. Please designate flavor when ordering. Inquire about other retail locations.